Hyundai Santa Fe Performance, Engine, Ride, Handling | What Car? You don’t have to worry about choosing an engine: there’s only one. It’s a 197bhp 2.2-litre diesel that pulls well from low revs, no matter whether you opt for a manual or an automatic gearbox. 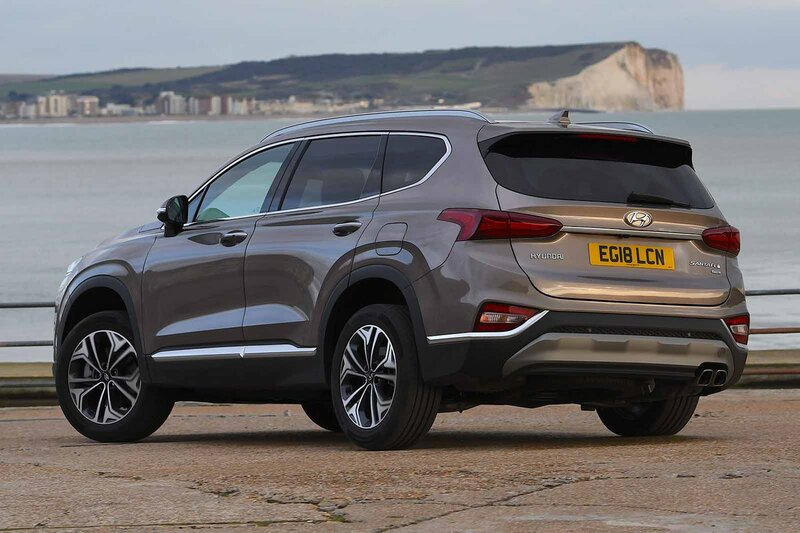 Outright performance is on a par with the Peugeot 5008 2.0 HDi 180, although that car does have a quicker-responding automatic gearbox – the Santa Fe’s tends to dither a bit when you ask for a burst of acceleration. So far, we’ve only tried the Santa Fe with the relatively chunky 19in alloy wheels that come as standard on range-topping Premium SE trim. On the whole, the ride is still pretty comfortable, although the car trips up more readily over bigger bumps and potholes than an equivalent 5008. Go for SE or Premium trim and you’ll get smaller wheels (17in and 18in respectively) which should help make the Santa Fe even comfier. Unless you work for the Forestry Commission, your SUV will spend most of its time driving on Tarmac, so on-road driving manners are clearly the priority here. On the whole, the Santa Fe handles tidily enough. There is, unsurprisingly, some body lean through tight turns, but despite being a tall, heavy car it never lurches around in an uncontrolled fashion. The only big disappointment is the steering, which is too heavy and feels very unnatural with it; both things conspire to make positioning the car on the road more of a chore than it should be. If you’re planning to tow, you’ll find the Santa Fe a stable choice. Stick with a manual gearbox and you’ll be able to pull a braked trailer of 2500kg, whereas the automatic versions can only tow 2000kg. That’s reasonable, but the Mitsubishi Shogun Sport can manage 3500kg. The Santa Fe is a relatively hushed choice – even compared with premium-badged alternatives such as the Land Rover Discovery Sport. There isn’t too much road or wind noise on the motorway and the diesel engine is never uncouth – even when you work it quite hard. So, as long as you aren’t expecting the sort of whisper quiet road manners to rival, say, an Audi Q7, you won’t be disappointed.